Bali was a popular location for many tourists, especially Australians, but in 2002 that was changed by three bombs that killed 202 people including 164 foreign nationals (88 Australians, 26 British and seven Americans among the dead) and injured 209 more. At 11.05pm a suicide bomber detonated his backpack bomb inside the Paddy’s Pub nightclub. Unhurt clubbers rushed into the street but, fifteen seconds after the first bomb, another went off inside a white Mitsubishi van parked outside the Sari Club, opposite Paddy’s Pub. The 1.143 tonne (1.125 ton) bomb, which was made from potassium chlorate, aluminium powder and sulphur left a crater 1 m (1 yd) deep and wrecked buildings in the vicinity. A third bomb, filled with human excreta, was detonated outside the United States consulate in Denpasar but caused little damage. The local Sanglah hospital was unable to cope with the scale of the injured and some patients with particularly bad burns had to be flown to Darwin and Perth in Australia for treatment. Members of Jemaah Islamiyah, a violent Muslim group led by Abu Bakar Bashir, claimed responsibility for the outrage. The police began their investigation and quickly arrested Amrozi Nurhasyim who was still in bed. Police found evidence linking him to bomb-making. He named six accomplices: Imam Samudra, Ali Imron, Idris, Abdul Ghani, Dul Matin and Umar Patek. In April 2003 Indonesian authorities charged Abu Bakar Bashir with treason. On 2 September Bashir was acquitted of treason but convicted of other charges and jailed for four years. On 21 December 2006 Indonesia’s Supreme Court overturned Bashir’s conviction. On 30 April 2003 Amrozi was tried and on 8 August he was found guilty and sentenced to death. As sentence was passed he smiled and gave a thumbs up. 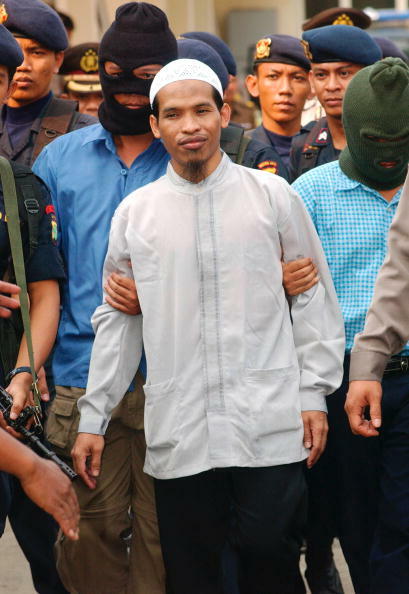 Imam Samudra was sentenced to death on 10 September. Ali Gufron was sentenced to death on 1 October. At 12.15am on 9 November 2008, the three men were executed by firing squad on the island prison of Nusakambangan. The deaths resulted in rioting in Tenggulan, East Java.